The FixStation is a product and process which allows one panel damaged to be repaired without moving the car. In the FixStation a technician starts and ends the repair for all stages of: disassembling, panel repair, body filler, primer, painting, reassembling and polishing. The FixStation is a spraybooth with air extraction in which you can repair the panel, welding or spotter, apply and sanding body filler and primer, painting and drying water base and clear. The drying is made with the Flydry that using technology Drytronic dries a panel of stucco, bottom, water base and clear in less than 2 minutes, allowing the technician to work continuously without waiting for flash off and drying. The FixStation is also equipped with its own paint mixing room and a BoxMultiservice with compressed air, electricity and vacuum sanding machine, all to make the technician totally independent without wasting time for displacements. Into FixStation a generic technician, in easy way, can repair four damages per day of one panel, a repair every two hours, for example; a fender, a door, a bonnet or a bumper that it can be repaired and painted without disassembling and reassembling from the vehicle. 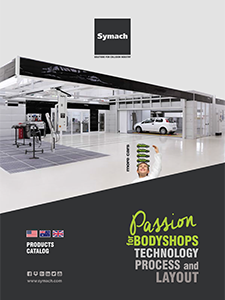 The FixStation is a station where takes place throughout the repair process and is self-sufficient because has every equipment inside, it can be installed in bodyshop but it is also a smart solution for car dealers and centers of fast repair.